Yes, it's that time of year for the Annual Trinity Yard Sale that is run buy the Rec. Centre. One person's junk is another's treasure, with some dealers mixed in ;-) Either way, fun deals to be had. Please contact the Rec Centre directly for details. 416.392.0743. Ready for spring blossoms, and a summer of lolling in the park? Us too!!!!! Join the community in a quick clean up - bring the family or venture solo to help beautify our fair park and the surrounding walkways. Get active, give back, and jump in to set the stage for an amazing summer in the park. We’ll supply the bags and arrange for proper disposal and recycling compliments of the City. Layer up, bring the sensible shoes in case of mud, and don’t forget gloves. Interested in being a Farmers' Market volunteer? Farmers' Market season starts May 8th and runs to October 30th. Are you available once a week for a few hours? If you are interested in helping sustain the market, getting to know farmers/vendors, appreciate the park-outdoors and not afraid of a little physical work, then this is for you. It's a rewarding experience and our vendors truly appreciate the hand. 12:30 to 2pm - Early set up - pylons reserve vendor parking. Some site clean up if necessary. 2pm to 3:30pm - Vendor load in, transport product to stall location, various organizational tasks. 3:30 to 7:30pm - Help with general tasks during market, tend the info tent. 6:30 to 7:45pm - Wrap/clean up for vendors and organizational. Set up in reverse. We sometimes need volunteers outside of market season for various tasks (flyer/lawn sign distrubution, painting, handy work etc.) Market logistics is team work and many of our local community members have made some awesome contributions over the years. We are so grateful for their generousity over the years and welcome newbies. Please visit our dedicated website for more info. The park is looking absolutely magical with the snow. Get out side and enjoy the sun and some winter activities in the park. The hills were alive with tobogganers the other day. Several cross country skiers are out there and of course the dogs love leaping in the white stuff. 2018 Outdoor Rink Schedule(s). Heed the date on the first one! It's also attached as a pdf so you can print and stick it on the fridge. Wed. Nov.1st 5pm-9pm Pumpkin Parade! 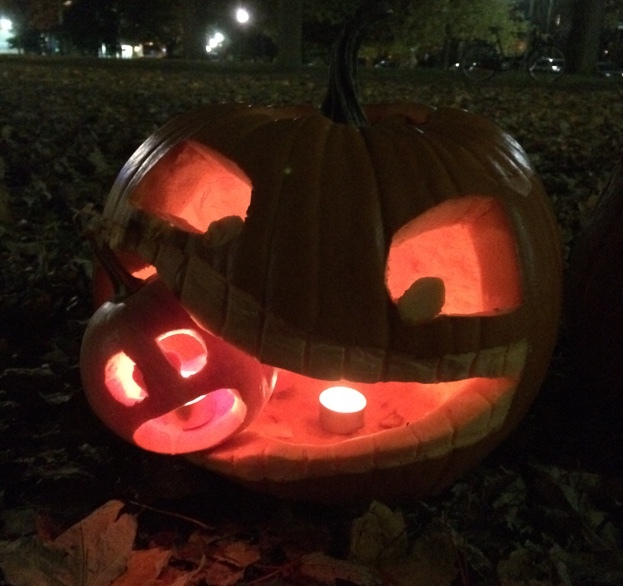 The Friends of Trinity Bellwoods Park (FoTBP) bring you the Annual Pumpkin Parade! The parade takes place along the east-west footpath that runs off Crawford near Lobb (north of playground) Drop off your carved pumpkins along the footpath (side by each) on both sides, anytime on Wednesday Nov. 1st, with a tea light inside. All pumpkins displayed will be lit by a volunteer. Enjoy the 'parade' and enjoy some free hot cider, from 6pm until it runs out. The parade is followed by the Pumpkin-Toss! Arrive around 9pm to toss the pumpkins (we remove the candles) into the bin provided by the city, for composting. The 'toss' is done because if we don't, they get smashed over night, not a pretty sight for young eyes the next day, let alone it's a smashing mess.